Cayo Hueso (Spanish pronunciation: [ˈkaʝo ˈweso]) is the original Spanish name for the island of Key West. Spanish-speaking people today also use the term Cayo Hueso when referring to Key West. It literally means "bone cay (a low island or reef)". It is said that the island was littered with the remains (bones) of prior native inhabitants, who used the isle as a communal graveyard. This island was the westernmost Key with a reliable supply of water. Many businesses on the island use names such as Casa Cayo Hueso, Cayo Hueso Consultants, Cayo Hueso y Habana Historeum, etc. In 1763, when Great Britain took control of Florida, the community of Spaniards and Native Americans were moved to Havana. Florida returned to Spanish control 20 years later, but there was no official resettlement of the island. Informally the island was used by fishermen from Cuba and from the British, who were later joined by others from the United States after the latter nation's independence. While claimed by Spain, no nation exercised de facto control over the community there for some time. On March 25, 1822, Lt. Commander, Matthew C. Perry, sailed the schooner Shark to Key West and planted the U.S. flag, claiming the Keys as United States property. No protests were made over the American claim on Key West, so the Florida Keys became the property of the United States. After claiming the Florida Keys for the United States, Perry renamed Cayo Hueso (Key West) to "Thompson's Island" for Secretary of the Navy Smith Thompson, and the harbor "Port Rodgers" in honor of War of 1812 hero and President of the Navy Supervisors Board John Rodgers. In 1823, Commodore David Porter of the United States Navy West Indies Anti-Pirate Squadron took charge of Key West, which he ruled (but, according to some, exceeding his authority) as military dictator under martial law. Porter was tasked by the American Navy to end acts of piracy in the Key West area including slave ships. Pardon C. Greene is the only one of the four "founding fathers" to establish himself permanently on the island, where he became quite prominent as head of P.C. Greene and Company. He was a member of the city council and also served briefly as mayor. He died in 1838 at the age of 57. John Whitehead lived in Key West for only eight years. He became a partner in the firm of P.C. Greene and Company from 1824 to 1827. A lifelong bachelor, he left the island for good in 1832. He came back only once, during the Civil War in 1861, and died the next year. John W.C. Fleeming was English-born and was active in mercantile business in Mobile, Alabama, where he befriended John Simonton. Fleeming spent only a few months in Key West in 1822 and left for Massachusetts, where he married. He returned to Key West in 1832 with the intention of developing salt manufacturing on the island but died the same year at the young age of 51. The names of the four "founding fathers" of modern Key West were given to main arteries of the island when it was first platted in 1829 by William Adee Whitehead, John Whitehead's younger brother. That first plat and the names used remained mostly intact and are still in use today. Duval Street, the island's main street, is named after Florida's first territorial governor, who served between 1822 and 1834 as the longest serving governor in Florida's U.S. history. William Whitehead became chief editorial writer for the "Enquirer", a local newspaper, in 1834. He had the genius of preserving copies of his newspaper as well as copies from the "Key West Gazette", its predecessor. He later sent those copies to the Monroe County clerk for preservation, which gives us a precious view of life in Key West in the early days (1820–1840). In 1852 the first Catholic Church, St. Mary's Star-Of-The-Sea was built. The year 1864 became a landmark for the church in South Florida when five Sisters of the Holy Names of Jesus and Mary arrived from Montreal, Canada, and established the first Catholic school in South Florida. The Convent of Mary Immaculate, the oldest Catholic School in Florida which is now known as Mary Immaculate Star of the Sea School. During the American Civil War, while Florida seceded and joined the Confederate States of America, Key West remained in U.S. Union hands because of the naval base. However, most locals were sympathetic to the South, and many flew Confederate flags over their homes. Fort Zachary Taylor, constructed from 1845 to 1866, was an important Key West outpost during the Civil War. Construction began in 1861 on two other forts, East and West Martello Towers, which served as side armories and batteries for the larger fort. When completed, they were connected to Fort Taylor by railroad tracks for movement of munitions. Fort Jefferson, located about 68 miles (109 km) from Key West on Garden Key in the Dry Tortugas, served after the Civil War as the prison for Dr. Samuel A. Mudd, convicted of conspiracy for setting the broken leg of John Wilkes Booth, the assassin of President Abraham Lincoln. In the late 19th century, salt and salvage declined as industries, but Key West gained a thriving cigar-making industry. During Cuba's unsuccessful war for independence in the 1860s and 1870s, many Cubans sought refuge in Key West. The Battleship USS Maine sailed from Key West on its fateful visit to Havana, where it blew up, igniting the Spanish-American War. Crewmen from the ship are buried in Key West, and the Navy investigation into the blast occurred at the Key West Customs House. Pan American Airlines was founded in Key West, originally to fly visitors to Havana, in 1926. The airline contracted with the United States Postal Service in 1927 to deliver mail to and from Cuba and the United States. The mail route was known as the "Key West, Florida Havana Mail Route". In 1978, the mayor of Key West, Charles "Sonny" McCoy, water-skiied to Cuba. Although local legend and authors such as Joy Williams have claimed McCoy did this to demonstrate the necessity of a military presence in Key West (Williams actually states he made the trip in the early 1980s), sources from the time make no note of such a motivation for the stunt. He made the trip in 6 hours, 10 minutes on a slalom ski. Key West Cemetery near Solares Hill, the highest point of land on the island. (24.559166, −81.784031). The maximum elevation above sea level is about 18 feet (6 m), a 1-acre (4,000 m2) area known as Solares Hill. According to the United States Census Bureau, the city has a total area of 7.4 square miles (19 km2), of which 5.9 square miles (15 km2) is land and 1.5 square miles (3.9 km2) (19.73%) is water. Since the 1940s, the island has more than doubled in size via landfill. The new section on the eastern side is called "New Town." It contains shopping centers, retail malls, residential areas, schools, ball parks, and Key West International Airport. According to the Key West Association of Realtors (KWAR), Key West can be divided into four distinct areas: Old Town, Casa Marina, Mid-Town and New Town, with various neighborhoods in each area. Key West and most of the rest of the Keys are on the dividing line between the Atlantic Ocean and the Gulf of Mexico. The two bodies have different currents, with the calmer and warmer Gulf of Mexico being characterized by great clumps of seagrass. The area where the two bodies merge between Key West and Cuba is called the Straits of Florida. The U.S. government then rebuilt the rail route as an automobile highway, completed in 1938, which became an extension of United States Highway 1. The portion of U.S. 1 through the Keys is called the Overseas Highway. Franklin Roosevelt toured the road in 1939. Key West has a tropical savanna climate (Köppen Aw, similar to the Caribbean islands). Like most tropical climates, Key West has only a small difference in monthly mean temperatures between the coolest month (January) and the warmest month (July) – with the annual range of monthly mean temperatures between the coolest and warmest only 14 °F (8 °C). With an average annual temperature of 77.8 °F (25 °C), it is one of the warmest cities in the U.S. The stable climate and warm winter weather is what makes Key West (and the Florida Keys as well) a popular tourist destination for many travelers from North American and Europe much of the year outside of the rainy season from June through September, although travelers arrive in all months. Key West averages more than 3000 hrs of sunshine annually. With the exception of other locations in the Florida Keys, Key West is the only location in the mainland U.S. known to never have had a frost or freeze – the lowest temperature on record was 41 °F (5 °C) on January 12, 1886 and January 13, 1981. Prevailing easterly tradewinds and sea breezes suppress the usual summertime heating, with temperatures rarely reaching 95 °F (35 °C). There are 55 days per year with 90 °F (32 °C) or greater highs, with the average window for such readings June 10 thru September 22, shorter than almost the entire southeastern U.S. However, low temperatures often remain above 80 °F (27 °C). The all-time record high temperature is 97 °F (36 °C) on August 29, 1956 and July 19, 1880. Key West falls under the USDA 11b Plant Hardiness zone. The Navy Mole pier in Key West, showing two cruise ships docked. In 1984 the city opened a pier right on Mallory Square. The decision was met with considerable opposition from people who felt it would disrupt the tradition of watching the sunset at Mallory Square. Cruise ships now dock at all three piers. As of December, 2012 due to a narrow channel, larger cruise ships increasingly bypass Key West. A referendum will be held in Key West in the fall of 2013 regarding whether to request a feasibility study from the Army Corps of Engineers for a $36 million project to dredge a wider channel. Economic benefits from visiting cruise ship passengers are substantial but not attractive to all Key West citizens as the daily presence of thousands of tourists from cruise ships affects the character of the city resulting in operation of facilities that cater to mass tourism rather than to a potentially more profitable and pleasant upscale clientele. 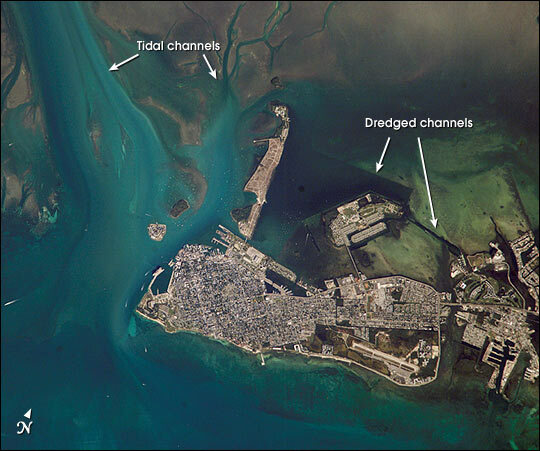 There are also environmental issues as Key West is surrounded by coral habitat. As of the census of 2000, there were 25,478 people, 11,016 households, and 5,463 families residing in the city. The population density was 4,285.0 inhabitants per square mile (1,653.3/km²). There were 13,306 housing units at an average density of 2,237.9 per square mile (863.4/km²). The racial makeup of the city was 84.94% White, 9.28% African American, 0.39% Native American, 1.29% Asian, 0.05% Pacific Islander, 1.86% from other races, and 2.18% from two or more races. Hispanic or Latino persons of any race were 16.54% of the population. In the city the population was spread out, with 16.0% under the age of 18, 8.4% from 18 to 24, 37.1% from 25 to 44, 26.7% from 45 to 64, and 11.7% who were 65 years of age or older. The median age was 39 years. For every 100 females there were 122.3 males. For every 100 females age 18 and over, there were 126.0 males. The median income for a household in the city was $43,021, and the median income for those classified as families was $50,895. Males had a median income of $30,967 versus $25,407 for females. The per capita income for the city was $26,316. About 5.8% of families and 10.2% of the population were below the poverty line, including 11.5% of those under age 18 and 11.3% of those age 65 or over. The ancestries most reported in 2000 were English (12.4%), German (12.2%), Irish (11.3%), Italian (6.8%), "American" (6.0%) and French (3.6%). Many of the residents of Key West were immigrants from the Bahamas, known as Conchs (pronounced 'conks'), who arrived in increasing numbers after 1830. Many were sons and daughters of Loyalists who fled to the nearest Crown soil during the American Revolution. In the 20th century many residents of Key West started referring to themselves as "Conchs", and the term is now generally applied to all residents of Key West. Some residents use the term "Conch" (or, alternatively, "Saltwater Conch") to refer to a person born in Key West, while the term "Freshwater Conch" refers to a resident not born in Key West but who has lived in Key West for seven years or more. However, the true original meaning of Conch applies only to someone with European ancestry who immigrated from the Bahamas. It is said that when a baby was born, the family would put a conch shell on a pole in front of their home. Many of the black Bahamian immigrants that arrived later live in an area of Old Town next to the Truman Annex called "Bahama Village". Major industries in Key West in the early 19th century included fishing, salt production, and salvage. In 1860 wrecking made Key West the largest and richest city in Florida and the wealthiest town per capita in the U.S. A number of the inhabitants worked salvaging shipwrecks from nearby Florida reefs, and the town was noted for the unusually high concentration of fine furniture and chandeliers that the locals used in their own homes after salvaging them from wrecks. Key West is much closer to Havana than it is to Miami. In 1890, Key West had a population of nearly 18,800 and was the biggest and richest city in Florida. Half the residents were said to be of Cuban origin, and Key West regularly had Cuban mayors, including the son of Carlos Manuel de Céspedes, father of the Cuban Republic, who was elected mayor in 1876. Cubans were actively involved in reportedly 200 factories in town, producing 100 million cigars annually. José Martí made several visits to seek recruits for Cuban independence starting in 1891 and founded the Cuban Revolutionary Party during his visits to Key West. Key West is governed via the mayor-council system. The city council is known as the city commission. It consists of six members each elected from individual districts. The mayor is elected in a citywide vote. Mayors of Key West have reflected the city's cultural and ethnic heritage. Among its mayors are the first Cuban mayor and one of the first openly gay mayors. One mayor is also famous for having water-skiied to Cuba. In 1982 the city of Key West briefly declared its "independence" as the Conch Republic in a protest over a United States Border Patrol blockade. This blockade was set up on U.S. 1, where the northern end of the Overseas Highway meets the mainland at Florida City. The blockade was in response to the Mariel Boatlift. A traffic jam of 17 miles (27 km) ensued while the Border Patrol stopped every car leaving the Keys, supposedly searching for illegal immigrants attempting to enter the mainland United States. This paralyzed the Florida Keys, which rely heavily on the tourism industry. Flags, T-shirts and other merchandise representing the Conch Republic are still popular souvenirs for visitors to Key West, and the Conch Republic Independence Celebration—including parades and parties—is celebrated every April 23. District-operated primary schools serving Key West Island include Glynn R. Archer Elementary School and Poinciana Elementary School. Gerald Adams Elementary School in the City of Key West serves Stock Island. Sigsbee Charter School is a K-7 school of choice, sanctioned by the District and serving predominantly military dependent children as well as children from the community at large. Admission to Sigsbee Charter School is limited and the waiting list is managed by a lottery system. Key West Montessori Charter School is a district-sanctioned charter school on Key West Island. All of Key West is zoned to Horace O'Bryant Middle School and Key West High School, located on Key West Island. Monument marking the southernmost point in the continental United States accessible by civilians, located at the corner of South Street and Whitehead Street. One of the biggest attractions on the island is a concrete replica of a buoy at the corner of South and Whitehead Streets that claims to be the southernmost point in the contiguous 48 states (see Extreme Points for more information.) The point was originally just marked with a sign, which was often stolen. In response to this, the city of Key West erected the now famous monument in 1983. Brightly painted and labeled "SOUTHERNMOST POINT CONTINENTAL U.S.A.", it is one of the most visited and photographed attractions in Key West. Whitehead Spit, on the Truman Annex property just west of the buoy, is the true southernmost point, but it has no marker since it is U.S. Navy land and cannot be entered by civilian tourists. The private yards directly to the east of the buoy and the beach areas of Truman Annex and Fort Zachary Taylor Historic State Park also lie farther south than the buoy. The farthest-south location that the public can visit is the seaward end of the White Street Pier. Florida's--and thus the continental United States'—true physically southernmost point is Ballast Key, a private island owned by David W. Wolkowsky, a wealthy developer, about 10 miles (16 km) west of Key West. Although Ballast Key is located within both the Key West National Wildlife Refuge and the Florida Keys National Marine Sanctuary, signs on the island strictly prohibit unauthorized visitors. The claim "90 Miles to Cuba" on the monument is only approximate, since Cuba at its closest point is 94 statute miles (151 km) from Key West. The original Key West settlement on the western part of the island is called "Old Town" and comprises the Key West Historic District. It includes the major tourist destinations of the island, including Mallory Square, Duval Street, the Truman Annex and Fort Zachary Taylor. It is where are found the classic bungalows and guest mansions. Generally, the structures date from 1886 to 1912. The basic features that distinguish the local architecture include wood-frame construction of one- to two-and-a-half-story structures set on foundation piers about three feet above the ground. Exterior characteristics of the buildings are peaked "metal" roofs, horizontal wood siding, gingerbread trim, pastel shades of paint, side-hinged louvered shutters, covered porches (or balconies, galleries, or verandas) along the fronts of the structures, and wood lattice screens covering the area elevated by the piers. Several U.S. presidents have visited Key West. Harry Truman visited for 175 days on 11 visits during his presidency and visited several times after he left office (see Truman Annex). Key West was in a down cycle when Franklin D. Roosevelt visited in 1939. The buildup of military bases on the island occurred shortly thereafter. In addition to Truman, Dwight D. Eisenhower stayed in Key West following a heart attack. In November 1962, John F. Kennedy visited Key West a month after the resolution of the Cuban Missile Crisis. Jimmy Carter held a family reunion in Key West after leaving office. Key West was always an important military post, since it sits at the northern edge of the deepwater channel connecting the Atlantic and the Gulf of Mexico (the southern edge 90 miles (140 km) away is Cuba) via the Florida Straits. Because of this, Key West since the 1820s had been dubbed the "Gibraltar of the West." Fort Taylor was initially built on the island. The Navy added a small base from which the USS Maine sailed to its demise in Havana at the beginning of the Spanish-American War. NAS Key West - This is the main facility on Boca Chica, where the Navy trains its pilots. Staff are housed at Sigsbee Park. In 2006 there were 1,650 active-duty personnel; 2,507 family members; 35 Reserve members; and 1,312 civilians listed at the base. In the 1990s the Navy worked out an agreement with the National Park Service to stop sonic booms near Fort Jefferson in the Dry Tortugas. Many of the training missions are directed at the Marquesas "Patricia" Target 29 nautical miles (54 km) due west of the base. The target is a grounded ship hulk 306 feet (93 m) in length that is visible only at low tide. Bombs are not actually dropped on the target. Truman Annex - The area next to Fort Taylor became a submarine pen and was used for the Fleet Sonar School. President Harry S. Truman was to make the commandant's house his winter White House. The Fort Taylor Annex was later renamed the Truman Annex. This portion has largely been decommissioned and turned over to private developers and the city of Key West. However, there are still a few government offices there, including the new NOAA Hurricane Forecasting Center. The Navy still owns its piers. Trumbo Annex - The docking area on what had been the railroad yard for Flagler's Overseas Railroad is now used by the Coast Guard. Free-roaming chicken family as typically seen on the streets of Key West. Key West Lighthouse, built in 1847. The Studios of Key West, founded in 2006 and based at the island's historic Armory building, was established as a new model for an artist community. It comprises a dozen working studio spaces, a main exhibition hall, a sculpture garden, and several adjoining residences and cottages. Its programming continues to grow and includes an extensive series of creative workshops, free humanities lectures, cultural partnerships, and innovative ideas for artists and audiences. The Key West Butterfly and Nature Conservatory opened in 2003 and features a 5,000-square-foot (460 m²) glass-domed tropical butterfly habitat. The Key West Lighthouse and Keeper's Quarters Museum preserves the history of the Key West Lighthouse, built in 1847. Nobel Prize–winning author Ernest Hemingway's former home is now open to the public as a museum, populated by as many as 60 descendants of his famous polydactyl cats. In 1979 the Key West Tourist Development Association, Inc., started Fantasy Fest to attract tourists at the traditionally slow time of Halloween, which is at the end of the hurricane season. Fantasy Fest regularly attracts approximately 80,000 people to the island and has become a huge success. In June 2006 the Key West Gay & Lesbian Museum & Archive opened at the Gay and Lesbian Community Center at 513 Truman Avenue. Featured exhibits include a Tennessee Williams typewriter as well as an extensive collection of memorabilia and papers of Richard A. Heyman, who was one of the nation's first openly gay mayors. The television stations received in Key West are the stations in the Miami-Fort Lauderdale Designated Market Area with rebroadcast transmitters in Key West and Marathon. Comcast provides cable television service. DirecTV and Dish Network provide Miami-Fort Lauderdale local stations and national channels. The Florida Keys Keynoter and the Key West Citizen are published locally and serve Key West and Monroe County. The Southernmost Flyer, a weekly publication printed in conjunction with the Citizen, is produced by the Public Affairs Department of Naval Air Station Key West and serves the local military community. The Ernest Hemingway House, a popular tourist attraction in Key West. Legend has it that Ernest Hemingway wrote A Farewell to Arms while living above the showroom of a Key West Ford dealership at 314 Simonton Street while awaiting delivery of a Ford roadster purchased by the uncle of his wife, Pauline, in 1928. The Hemingways had taken up residence at 1301 Whitehead Street until Pauline's rich uncle Gus Pfeiffer bought the 907 Whitehead Street house in 1931 as a wedding present. Legend says the Hemingways installed a swimming pool for $20,000 in the late 1930s (equivalent to $330,000 in 2013). It was such a high price that Hemingway is said to have put a penny in the concrete, saying, "Here, take the last penny I've got!" The penny is still there. During his stay he wrote or worked on Death in the Afternoon, For Whom the Bell Tolls, The Snows of Kilimanjaro, and The Short Happy Life of Francis Macomber. He used Depression-era Key West as the setting for To Have and Have Not — his only novel set in the United States. Pauline and Hemingway divorced in 1939, and Hemingway only occasionally visited while returning from Havana until his suicide in 1961. The six- or seven-toed polydactyl cats descended from Hemingway's original pet 'Snowball' still live on the grounds and are cared for at the Hemingway House, despite complaints by the U.S. Department of Agriculture that they are not kept free from visitor contact. And the Key West City Commission exempted the house from a law prohibiting more than four domestic animals per household. Williams had a series of rented homes all over the U.S., but the only home he owned was in Key West. Even though Hemingway and Williams were in Key West at the same time, they reportedly met only once—at Hemingway's Cuba home Finca Vigía. Several scenes were filmed in Key West in the 1986 hit movie Running Scared, starring Billy Crystal and Gregory Hines, a film about 2 Chicago undercover police officers who decide to retire and contemplate opening a bar in Key West. Key West served as the location for a number of scenes in the 1989 James Bond movie, Licence to Kill. The island was the setting for a 1993 TV series titled Key West. Key West is featured in the FOX TV series Drive. A level based on Key West is featured in the Sega arcade game Out Run. Key West is used as a destination city in the first stage of 18 Wheeler: American Pro Trucker, also by Sega. A number of songs have been written about Key West (Cayo Hueso). The song most associated with Key West is Margaritaville by Jimmy Buffett; however, "Margaritaville" was written in Fort Myers, Florida, but came to be synonymous with Key West due to the ties that Jimmy Buffett had to the city. The city never employed the use of the song for any marketing purposes, and there is no statistical data that exist measuring the impact of the song on the city. Two events that seemed to bring the two together was the implementation of bed tax that allowed for a larger marketing budget for the tourist development council along with the popularity of Jimmy Buffett himself and his fans knowing of his ties to Key West. The only direct link to the economic effect the Buffett’s persona or songs has had on the city is that once a year since 1991 his fans flock to Key West for the Parrott Heads in Paradise convention usually held the first weekend in November. John Cougar Mellencamp released a song in 1996 titled “Key West Intermezzo” that charted at #14 on Billboard charts. Elizabeth Bishop spent time in Key West basing some of her poetry on her experience of it. See, for example, "A Norther – Key West" (1962). ^ a b Lizette Alvarez (December 24, 2012). "Key West Looks at Identity as It Plots Tourism Future". The New York Times. http://www.nytimes.com/2012/12/25/us/25cruise.html. Retrieved December 25, 2012. ^ Key West: General History and Sketches - URL retrieved August 20, 2006. ^ Jerry Wilkinson. "History of Key West". Florida Keys History Museum. http://www.keyshistory.org/keywest.html. Retrieved 2012-08-29. ^ "Exploring Florida Documents: Key West: The Municipality". Florida Center for Instructional Technology. http://fcit.usf.edu/florida/docs/k/keys10.htm. Retrieved 2012-08-29. ^ |source 1 = <USDA.gov= >"USDA Plant Hardiness Zone Map". USDA. http://planthardiness.ars.usda.gov/PHZMWeb/#. Retrieved 24 February 2014. ^ "Home". The Ernest Hemingway Home & Museum. http://www.hemingwayhome.com/HTML/main_menu.html. Retrieved 2012-08-29. ^ All Music Guide to Country. Michael Erlewine. pp. 95–96. ISBN 0-87930-475-8. ^ a b c d Nickell, Patti. "Key West: The fun begins where the road ends." Lexington Herald-Leader. September 21, 2008. ^ "Ex-Texas Tech coach Mike Leach expects return to coaching". ESPN. 2010-03-18. http://sports.espn.go.com/ncf/news/story?id=5006561. Retrieved 2012-08-29. ^ Crankshaw, Joe. "Water District Chanded S. Florida." The Miami Herald. September 29, 1985. Page 2TC. ^ Bellido, Susana. "Shel Silverstein, 66, Children's book author." The Philadelphia Enquirer. May 11, 1999. This page uses content from the English language Wikipedia. The original content was at Key West, Florida. The list of authors can be seen in the page history. As with this Familypedia wiki, the content of Wikipedia is available under the Creative Commons License.